What It’s About: In the near future (at least, in the near future of 1981), former race car driver Franklyn Hart (Lee Majors) works for the oppressive, environmentally conscious government, lecturing on his conversion from race car driver to spokesman for public transportation. Seems that the oil finally ran out, and now (shudder) the government forces everyone to live in urban areas, take the subway, and recycle. When Franklyn can’t take it anymore, he drives his illegally rebuilt race car cross-country to California with a rebellious and technically gifted computer whiz named Ring (Chris Makepeace) in tow. Along the way the pair siphon the remaining fuel from old gas station tanks, meet up with people who have gone “back to the land” and run from government agents in golf carts. As a last resort the government pulls an aging Korean war vet (Burgess Meredith) out of retirement and sends him after Hart in an F-86 Sabre Jet. Can Hart and Ring make it to California? Why Watch It Today? : Richard Nixon signed the National Maximum Speed Law into effect on January 2, 1974. The law mandated 55 mph speed limits on highways around the country and was deeply hated by Americans who resented being told how fast they could drive. Eventually terrible music (“I Can’t Drive 55” by Sammy Hagar, for example) and films (arguably the entire run of 1970s komedy car chase films) resulted. The Last Chase is the nadir of the sub-genre giving us an unintentionally hilarious future where the government’s only option to chase Formula One race cars is a Korean War era fighter jet and pilot, and yet somehow defends its borders and keeps control of its population . One suspects that the films low-budget and Canadian (yes, the film in which public transportation and recycling are the stuff of 1984 is Canadian) origins may have something to do with this. Best watched with commentary by Mystery Science Theater 3000. 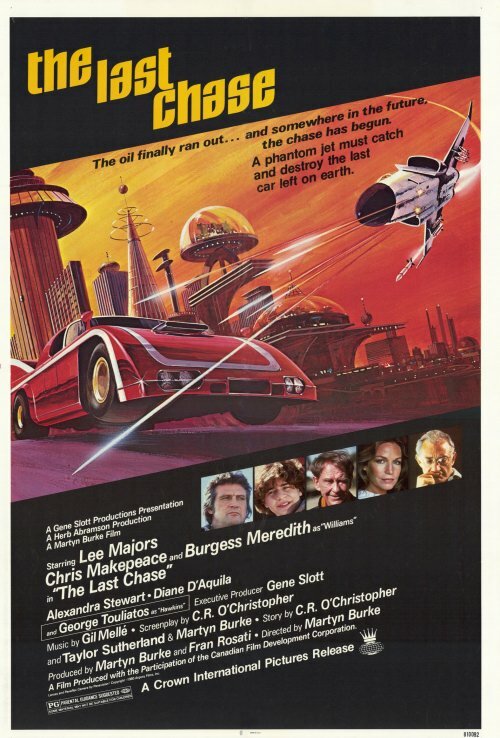 This entry was posted in Action, Chase, Dark Future, Movie of the Day, Sci-Fi, So-Bad-It's-Good, Speculative Sci-Fi and tagged Burgess Meredith, Canada, Canadian Film Development Corporation, Chris Makepeace, Crown International Pictures, Drive-In, F-86 Saber Jet, Lee Majors, low-budget, Sammy Snyders, Tax Shelter Film. Why’s there an F-4 on the poster? Just sexing it up? Guess they wanted to conceal that F-86? Can’t believe I never noticed! That’s one hell of a plot twist they’ve covered up, eh? There should be a glorious shot of the F-86 with The Penguin in the cockpit.